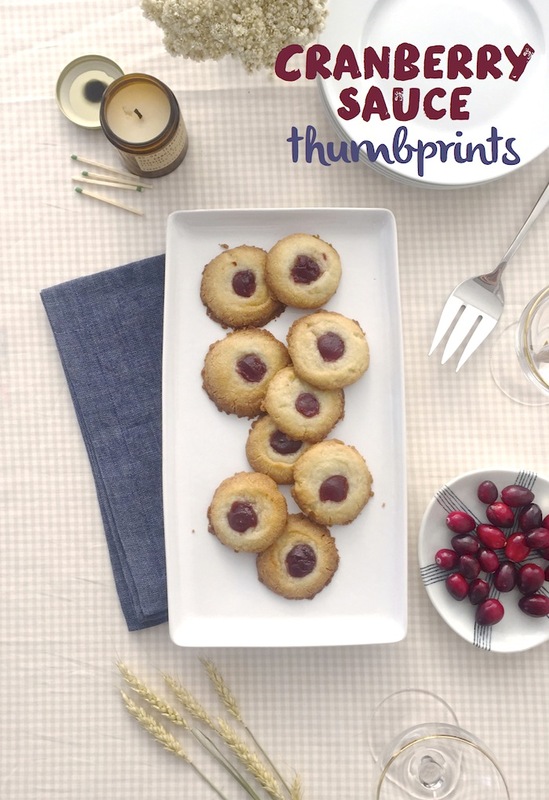 Cranberry Sauce Thumbprints for Thanksgiving! / Hey, EEP! 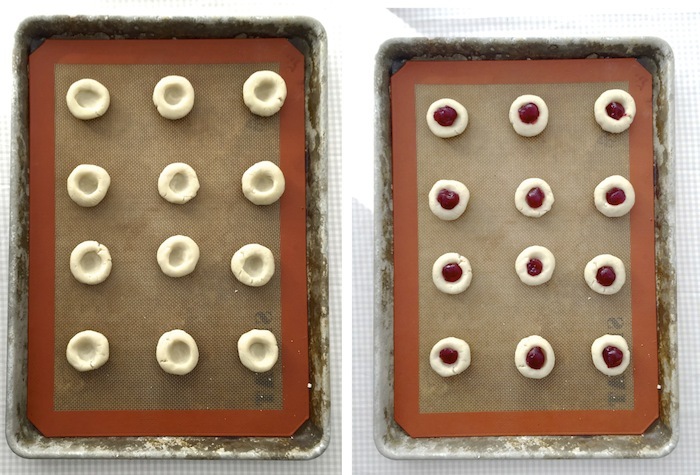 Cranberry Sauce Thumbprints for Thanksgiving! While everyone else is stressing about finally perfecting an un-cracked pumpkin pie, you could be breezing around with the ultimate T-day treat! Fact: Everyone loves cookies. And you're going to start baking them for Christmas the day after Turkey Day anyway, so why wait? Make these thumbprints for your family's celebration! This really is the easiest shortbread cookie recipe ever. We're talking butter, sugar, flour, pinch of salt. That's it! I added almond extract, since that's my favorite holiday cookie flavoring. If you want to leave it out (or use vanilla extract, instead) that's fine, too! The difference between these babies and your everyday thumbprints is that I'm using little mountain of canned cranberry sauce in place of jam. I thought it was a good idea but, turns out, it's a great idea! It's sweet-tart and totally perfect. Stick with the jellied stuff for the right consistency. If you're hosting Thanksgiving this year and stressing about time, whip up the dough tonight and keep it in the fridge until you're ready to start baking. I'm curious, are you a prep-a-food-few-day-ahead host or do you pull an all-nighter the evening before the big day? Like I said, this recipe really could not be easier but here's a quick video walking you through it incase you'd like some extra guidance. Wait! I almost forgot. Cranberry Sauce. Canned or homemade? Loose or molded? I'm dying to know. 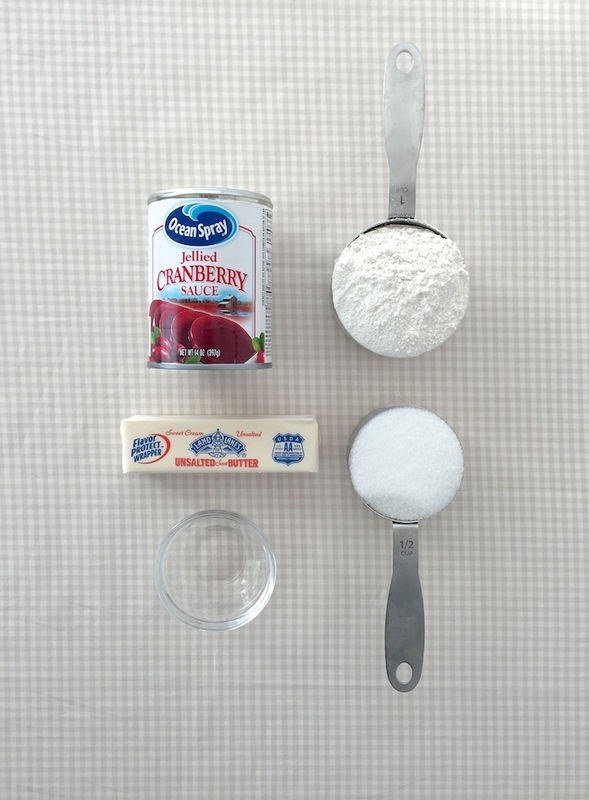 Our family does a homemade cranberry mold with yogurt that's out of this world. 1.Preheat the oven to 350˚F. Line a baking sheet with parchment paper or a nonstick silicone mat. 2. Beat the butter and sugar with a mixer on medium-high speed until light and fluffy. Add the almond extract and beat until combined. Add the flour all at once and a nice big pinch of salt. Beat on medium-low speed just until combined, scraping down the bowl as needed. Transfer to a bowl; cover with plastic wrap and chill 30 minutes. 3. Roll tablespoonfuls of dough into balls; make an indent in the center of each with you thumb. Arrange on the prepared baking sheet. 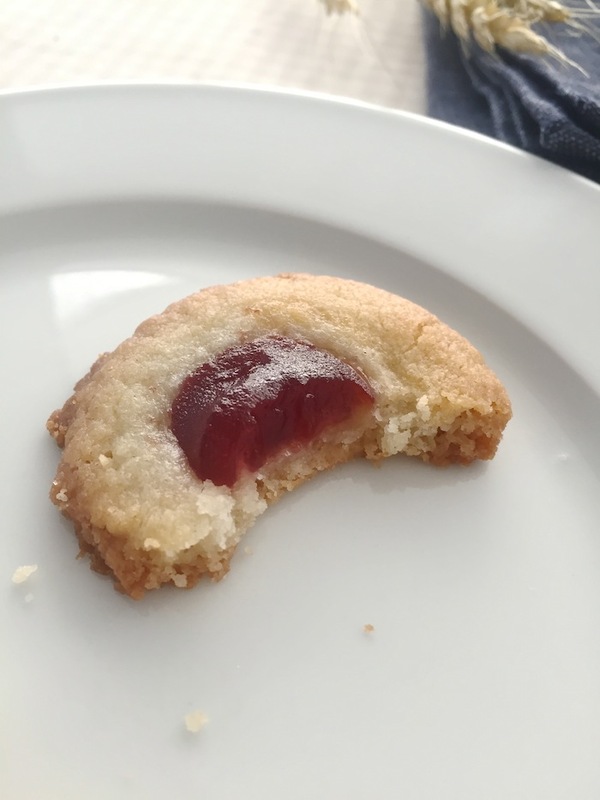 Add a heaping 1/4 teaspoon cranberry sauce to the center of each cookie. Bake until golden brown, 13 to 15 minutes. Let cool on the baking sheet 3 minutes, then transfer to a wire rack to cool completely. This is the most clever cookie idea Erin!